In the same vein that the Walla Walla Gas Plant —originally built to produce coal gas— was resurrected as the 342-seat Gesa Power House Theatre, McMinnville’s downtown diesel power plant has undergone a series of rebirths and the most recent one has truly brought its full potential to fruition. Opening in December 2013 as Elizabeth Chambers Cellar, much elbow grease was required to transform the nearly 90 year-old structure into the mix of warm and industrial that invites visitors to enjoy an elegant and earthy lineup of pinot noirs sourced from several vineyards throughout the Willamette Valley. Its towering brick walls were sandblasted to remove layers of paint; windows encased in black paint were replaced to allow light to flood the space that had most recently been used by another winery for barrel storage; and double doors were added along one wall, exposing a secret garden of sorts that now beckons guests outside, hosts wine club events and will even be the magical setting of a New Year’s Eve wedding. This labor of love seems the appropriate place to house an urban winery which, at its core, seeks to help wine drinkers re-envision winemaking on a vineyard in the countryside and give it a completely different backdrop. Lest anyone think Elizabeth Chambers Cellar is surrounded by smoke and mirrors, let me assure you that the effort put into the buildings’ transformation is dwarfed only by the attention given to their small batch pinots; whether noir or gris. In fact, the 2012 Lazy River Vineyard Pinot Noir recently received 94 points from Wine Spectator and their 2012 Freedom Hill Vineyard Pinot Noir (my favorite) garnered 94 points and Editor’s Choice from Wine Enthusiast. 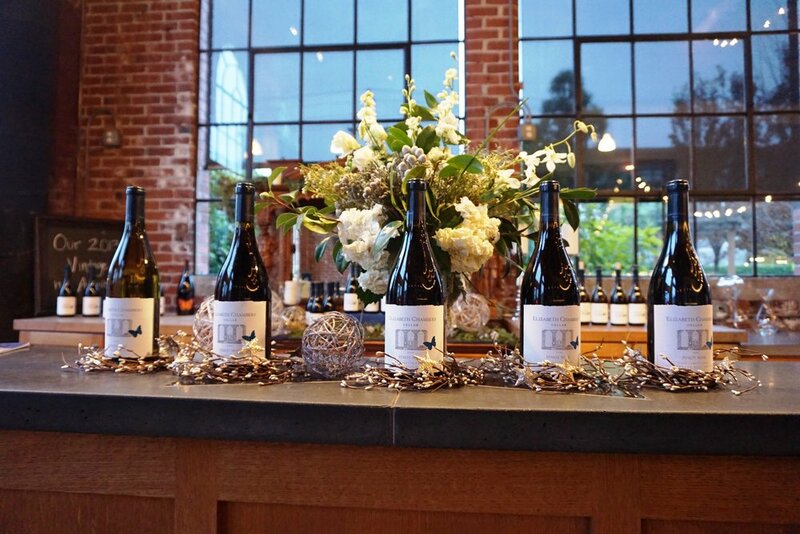 My recent visit to the tasting room included a comfortable conversation with wine club manager, Kacie Copeland, who shared spot on tasting notes for six pinot noirs which included a vertical flight of their 2011, 2012 and 2013 Lazy River Vineyard Pinot Noir. Verticals are a fantastic way to compare the sometimes subtle, sometimes obvious differences from vintage to vintage as well as how an elegant and finicky grape like pinot noir can evolve so beautifully in the bottle. Located one block off the main drag of downtown McMinnville at 455 NE Irvine Street, Elizabeth Chambers Cellar is a nice change of pace with a history lesson to boot.